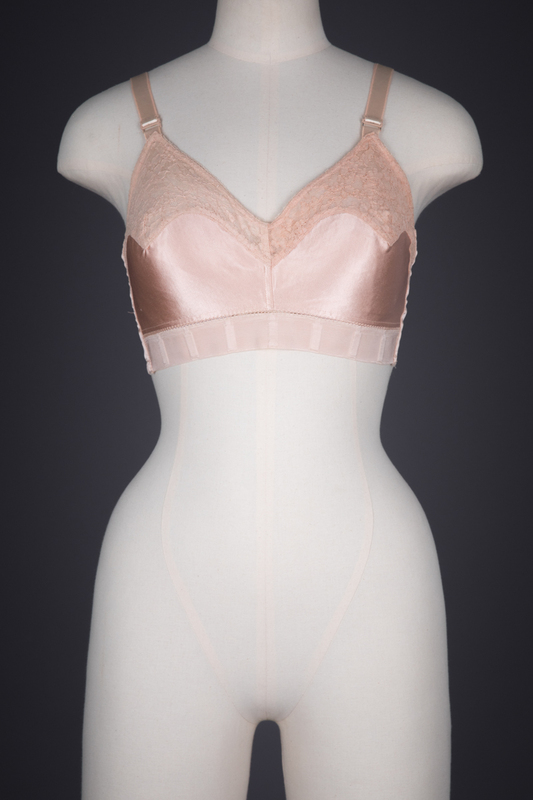 This bra is a relatively luxurious product from Warners, using fine fabrics such as silk blend satin and leavers lace, with hand finishing techniques such as hand stitched faggoting joining the body of the bra with the underband elastic. The upper cups are lined with cotton bobbinet tulle and cotton tape encases steel bones at the side seams. 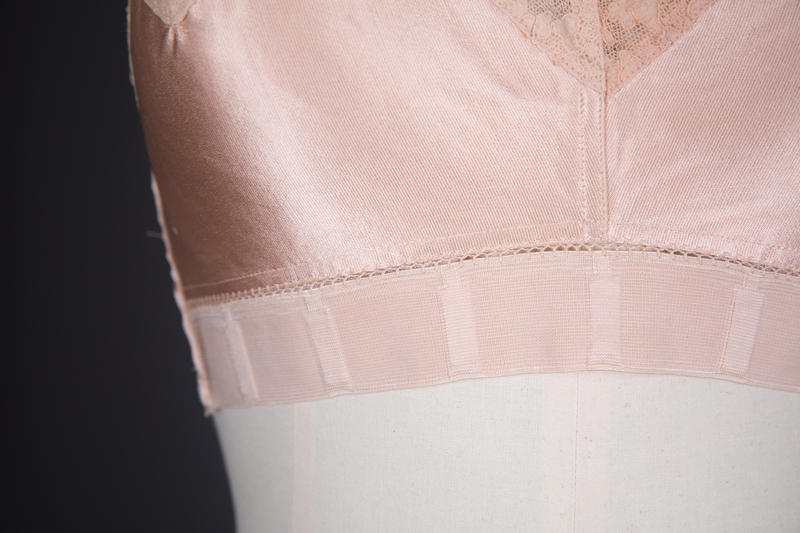 The centre back fastening is made of 3 rows of metal hooks and eyes. 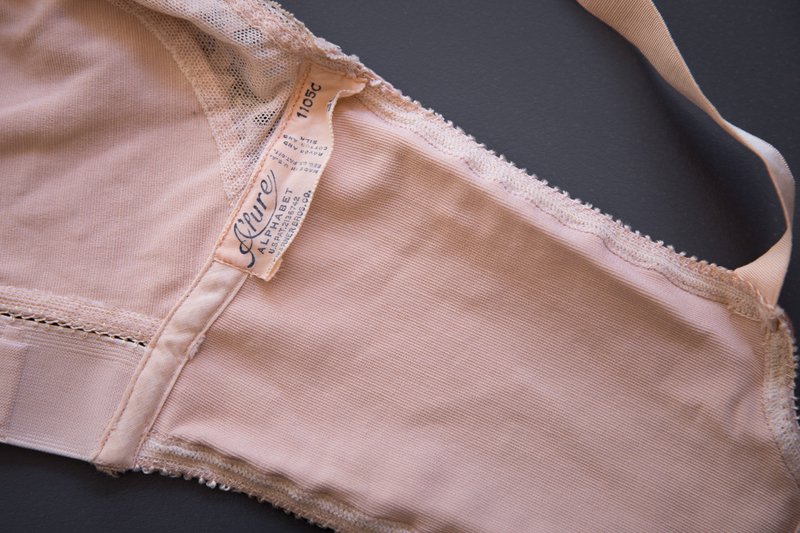 The elastic underband offers an unusual amount of fit flexibility for bras of this time period, though the rest of the garment does not have any other stretch. 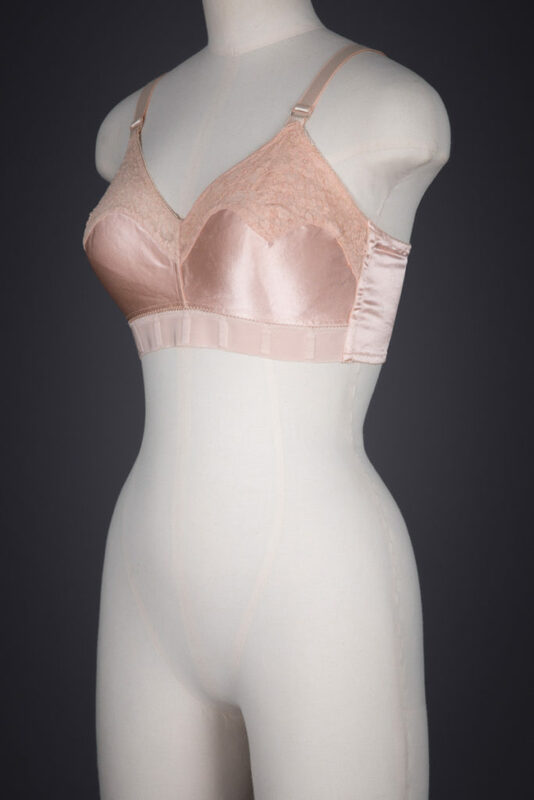 The garment has a number of unusual and innovative features for its age, including adjustable shoulder straps (made from a non-stretch rayon ribbon with metal adjusters) and cup sizing (the tags mark this as a 36 band C cup). Although it is unclear which brand was truly the first to instigate the use of cup sizing in their bras, some historians argue that Warner was the first to develop the use of A, B, C & D sizes. The bra features the patent number 2136742, granted in 1938, referring to the elastic underband used in this design. 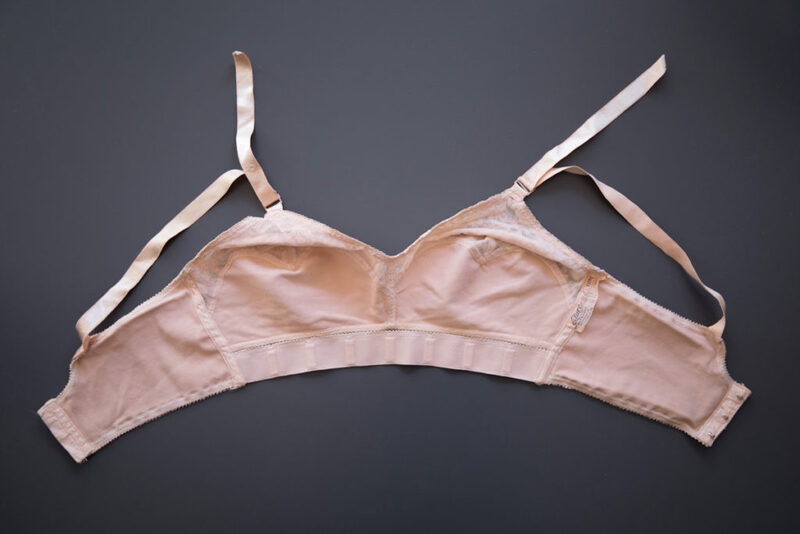 Vertical bones, most likely celluloid in this example, sandwiched within elastic tape with latex. 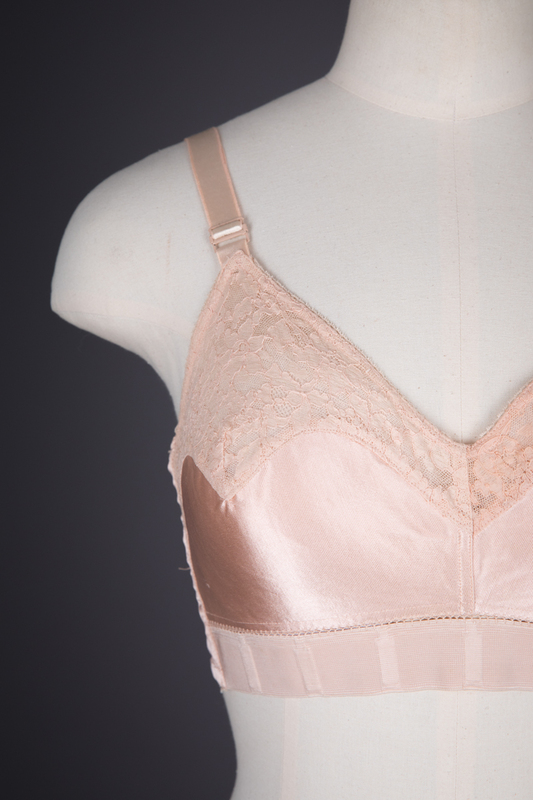 Warner was the first company to shorten the word brassiere in the text of a 1934 advertisement. 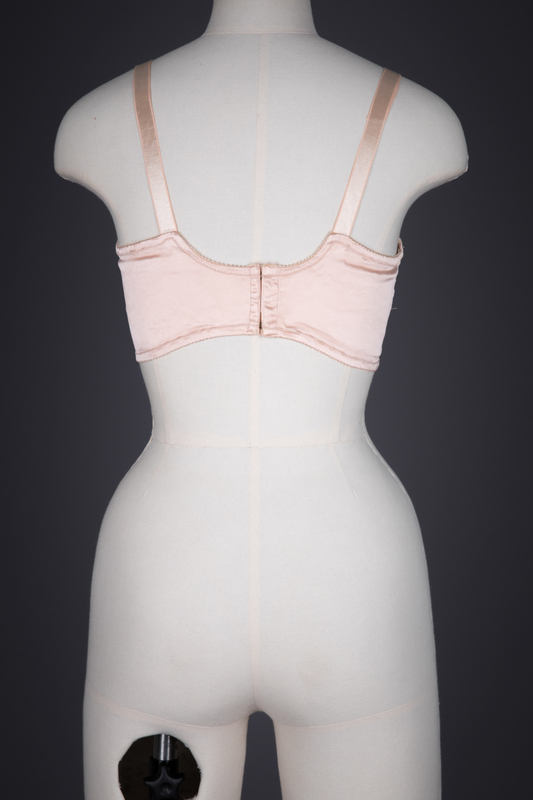 According to Jane Farrell-Beck and Colleen Gau’s book Uplift: The Bra in America, “by 1935, Warner officially marketed its A’lure Bra, truncating the word in the trade name.” The A’lure range was renowned for its flexible fit, pioneering a stretch fit that would adjust with changing body shapes.